American Stone Edge – Granite Countertops | Sacramento’s Natural Stone Pros. American Stone Edge is locally owned and operated in Sacramento, California and has been specializing in the fabrication and installation of exceptional quality Natural Stone products since opening our doors in 2003. We have been serving satisfied and happy residential and commercial clients in Sacramento and it's surrounding areas such as Roseville, Granite Bay, Folsom, Rocklin, Lincoln and El Dorado Hills to name a few, as well as Central California and Bay area residence and commercial clients ever since. With a team of highly skilled contractors(each one having having well over a decade of experience in Natural Stone fabricating and installation) ASE knows how to deliver a gorgeous end product, along with excellent customer care and service through every step of the process from start to finish! We install countertops, vanities, bars, backsplashes, cladding, mantles, entryways, fireplace surrounds, and many other kinds of beautiful stone surfaces to fit your unique needs and style design. 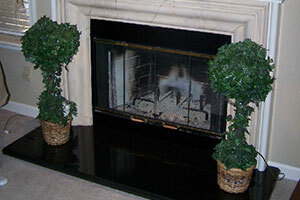 We work with natural stone such as Travertine, Granite, Onyx, Quartz, Quartzite, Soapstone, Marble, Slate and Limestone. Whether it be for your home's indoor or outdoor living space or your office or business, American Stone Edge is committed to providing you with uncompromised quality workmanship along with superior customer care and satisfaction. After all, Natural Stone Installation and Fabrication is our passion! We provide clients with a free quote based on their desired surface dimensions. We also will schedule a convenient time and come along with them to visit one of our fabulous stone vendors. This can be a really an enjoyable process where we assist you in selecting the most beautiful and perfect slab for your project offered through our vendor's slab selection. We have a knack for being able to suggest just the right pieces for our customers unique individualized needs . Just look at our testimonials! So, why not give us a call and schedule a free consultation now! 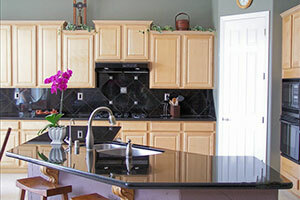 Our kitchen projects includae countertops, islands, backsplashes, and entryways. We offer removal services and plywood support installations to hold your stone in place. 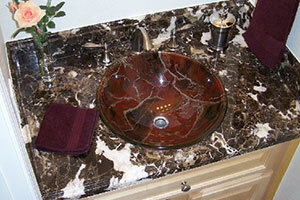 Natural stone vanities drastically improve the appearance of bathrooms in residential and commercial buildings. They enhance the aesthetics of the rest of your bathroom features.